We’ve been lucky enough to host several exciting events here at The Kirby, but we have to say that we’re particularly looking forward to our upcoming craft cocktail event, The Spirited Life on Thursday, September 3rd at 6pm. It brings together a few of our favorite things in a fun, educational and delicious way. Not only will you get gourmet food and drinks out of the deal, but you’ll also come away with new skills and knowledge that you can use to impress your friends at your next gathering. Along with a couple of very special guests, we’ll teach you all about the art of the cocktail and thoughtful food pairings while you sit back, relax and enjoy. 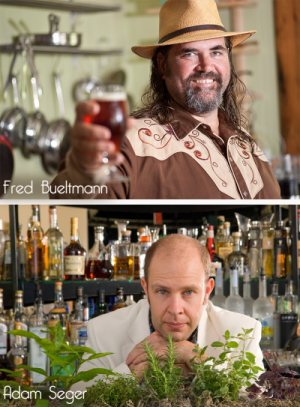 We’re so fortunate to be able to welcome a couple of nationally-renowned leaders in the craft spirits world to The Spirited Life dinner. First up we’ve got New Holland Brewing’s Vice President of Brand and Lifestyle, Fred Bueltman who is more commonly (and famously) known as “The Beervangelist.” Fred will be here to give us the inside scoop on the fantastic New Holland craft spirits that will be featured in the special cocktails you’ll be tasting (and learning how to make). The Beervangelist will also be sharing his unique take on the craft food and beverage movement, a topic that he is a committed and passionate expert on. The Kirby is also extremely lucky to welcome Adam Seger, who will be the evening’s resident mixologist and teacher. This internationally acclaimed authority has been called, “Chicago’s Godfather of Craft Cocktails” (Time Out), “The Charlie Trotter of Cocktails” (New City), and a “Spirits Guru” (Food & Wine and Fast Company). Adam is a Certified Culinary Professional, an advanced sommelier and an alum of some of the country’s top restaurants. So after you learn recipes and tips from him at this event, you’ll be able to say that you received a master’s class from one of the leading mixologists in the world. This very special event will kick off at 6 o’clock with the interactive mixologist class with Adam Seger, during which you’ll enjoy a delightful cheese and charcuterie spread and a rare opportunity to try New Holland Brewing’s Incorrigible, an unusual and delightful white sour beer. The first course will involve fish and a citrus salad paired with a drink that contains New Holland’s barrel-aged gin and a splash of their Clockwork Orange liquor to bring out the tart and sweet blood orange in the salad. Next up will be a mouth-watering meat dish paired with a smoky whiskey cocktail. And finally, for dessert we’ll serve a sweet potato and pecan pie with caramel sauce and an accompanying amber rum and ginger beer concoction we’re sure you’ll love. Here at J. Paul’s at The Kirby our passions are all things local and craft, so you can be sure that everything on the menu that night will be something special that comes from right here in Michigan. And even if you are a J. Paul’s frequent flyer, you should expect new dishes and combinations you’ve never seen on the menu. 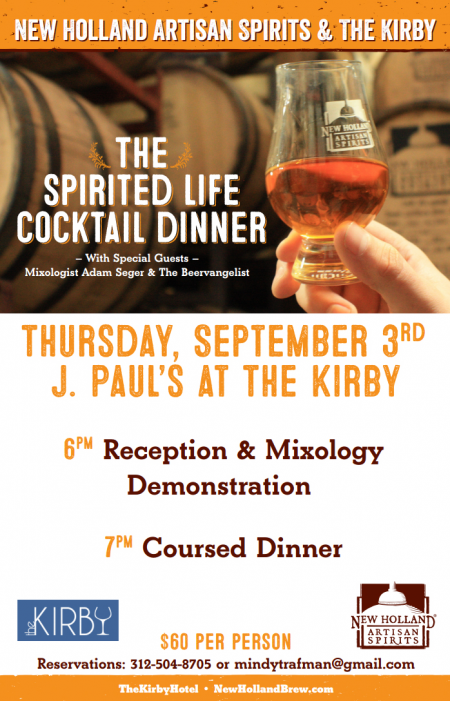 As you can see, The Spirited Life offers a distinctive opportunity to get up close and personal with some of the most knowledgeable craft spirits leaders in in the world as you relish a wonderful meal served with perfectly paired cocktails. The cost is just $60 per person for the class, the dinner and drinks (tax and gratuity not included). And if you’d like to make the evening even more special, get 20% off a luxurious room at The Kirby that night. 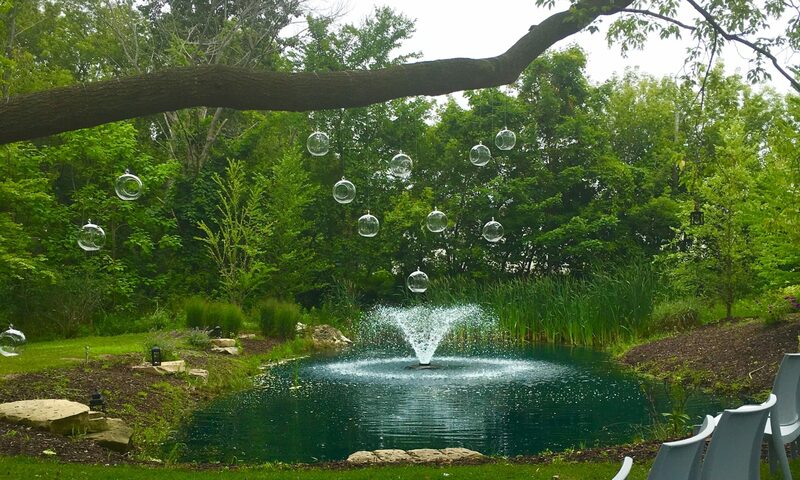 To reserve your spot, contact Mindy at 312.504.8705 or mindytrafman@gmail.com – hurry up before we fill up! Previous PostPrevious Try Our $5 HAPPY HOUR Menu!